The device received a bit of attention at FIFI08 but especially after the conference was over in the Dutch Twittersphere. Many people who did not attend the conference became curious and wanted to own a Poken. 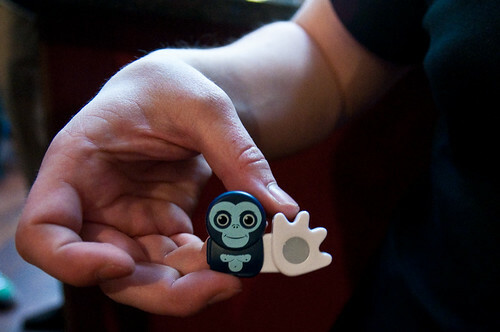 Several people started importing them from Switzerland (where Poken is located) and resell them online and on Twitter. One of those resellers on Twitter @jillesdotcom organized a meeting in Amsterdam so Poken owners could meet each other and other people could buy a Poken. When Poken Switzerland became aware of all the buzz that was going on in the Netherlands, they implemented the biggest Dutch social networking site Hyves. This is one of my critiques on Poken, that they have not implemented a lot of social networking sites or tools yet. When Poken headquarters became aware of the meeting they decided last minute to send their developer Marco Spirig to the meeting to answer questions and to bring a new stack of sold out Pokens. In the previous post I questioned whether the device would become popular or just with a very specific target group. Marco Spirig told us that the focus group is youngsters from 15-25 years old. Interestingly enough the median age of the 30-something attendees was also at least 30-something. This led to an interesting question that arose on Twitter after the meeting. Are they going to release more “business-like” or “casual” Poken USB devices as well? Here’s a small video with organizer @jillesdotcom and Poken developer Marco Spirig (half Dutch/half English). Poken Meetup 020 from silvertje on Vimeo. 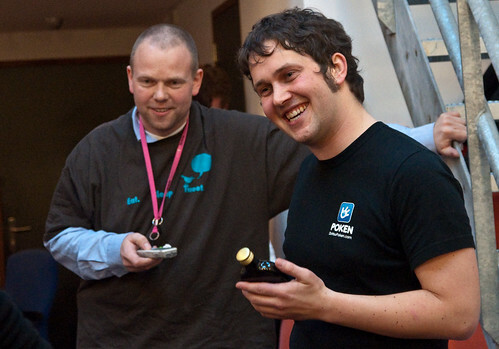 Attendee and Bright contributor Jaap Stronks interviewed me about Poken for BrightTV. In the accompanying article ‘Poken conquers the Netherlands‘ he called me the Poken-expert who asks the difficult questions (I love the device but I’m still critical). Here’s the video, again half in Dutch, half in English. More photos of the Poken Meetup 020 can be found on Flickr.